The Vinyl Council of Australia, with input from stakeholders, has undertaken a second five year review of the Product Stewardship Program to evaluate the Program’s effectiveness, focusing on the past five years 2007-2012. The review identifies future challenges for product stewardship in the PVC industry and proposes recommendations for ongoing Program development. The review has found that Signatories have made effective and measurable progress over the past five years in implementing the Product Stewardship Program. A number of milestones have been achieved, despite the make-up of the Signatory base changing in that period, with a larger proportion of businesses importing PVC products, and more small businesses participating. The progress made by Signatories against the commitments of the Program provides a strong foundation for the future. Nevertheless, the Vinyl Council and industry participants recognise that this is a journey and both the Program and the industry need to evolve to meet current and future challenges. A number of recommendations have been determined from the review, with the intention of updating and strengthening the Program to ensure it delivers effective improvements in an open and transparent way. The Program will remain a relevant mechanism for the achievement of the industry’s sustainability goals. Download the report here. 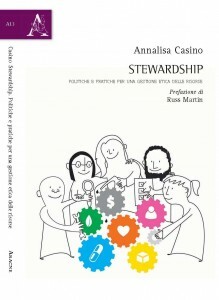 Annalisa Casino, leader of GlobalPSC member Stewardship Italia, has just published a new book on stewardship. GlobalPSC CEO Russ Martin was invited to contribute the preface to the book.